Pisces is the twelfth sign of the zodiac. The sun enters Pisces at slightly different times each year, usually around Feb 21, sometimes the day before or the day after. Saga, an attendant of Frigg, is a Scandinavian goddess whose name beans “seeress.” Saga is a student of the Universe, ever watchful and ever instructing us about the value of keen observation. She is directly connected with the sign of Pisces, which governs artistic expression, psychic abilities, and sensitivity towards others’ needs. In artistic representations, Saga bears a long Viking braid, an emblem of womanhood and honor. According to the Eddas, Saga lives at Sinking Beach, a waterfall, where she offers her guests a refreshing drink of inspiration from a golden cup. 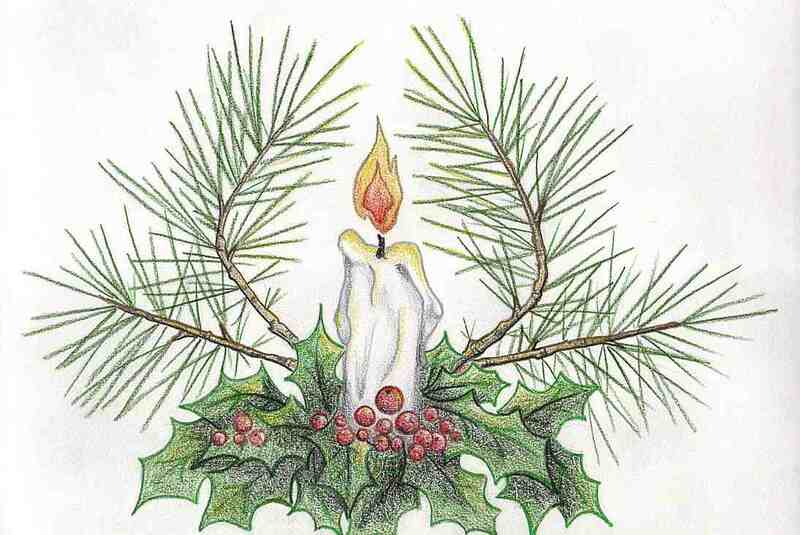 Later, her name was applied to the sacred heroic texts of the Scandinavian people. Tend your sacred journals today. Write about your path, your feelings, where you see yourself going, and where you’ve been. Saga lives in those words – in your musings, memories, and thoughts – guiding them to the paper to inspire you now and in the future. Invoke any of Saga’s attributes in your life today simply by practicing the art of observation. Really look at the world, your home, and the people around you. As you do, remember that little things count. Saga’s insight lies in the grain of sand and the wildflower as well as the stars. As the twelfth and last sign of the zodiac, Pisces contains within itself a little experience of all the signs. This gives Pisces Suns the ability to identify with people from all walks of life—from all backgrounds—in some way. These individuals are not only changeable and adaptable, they have open minds and tremendous understanding. But Pisces itself is often misunderstood. Pisces Suns may spend a good portion of their lives yearning for understanding, and the other part in a state of divine discontent. Suffering is sometimes glamorized in the Piscean world. 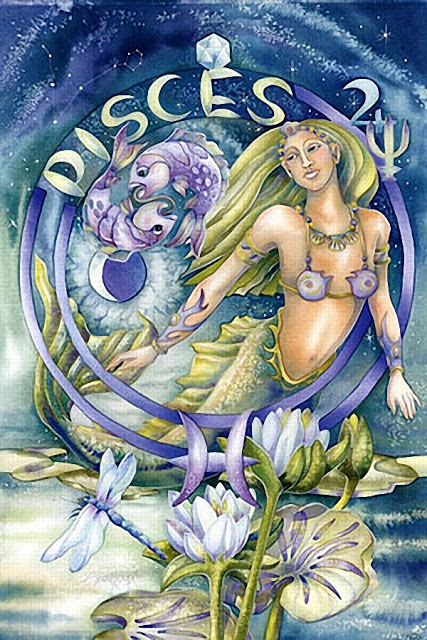 Sun in Pisces people are frequently pegged as wishy-washy, but this is all a matter of opinion. What you will find behind a vaguely directionless, spacey manner is a deep person with real dreams. Their dreams are more than getting that picket fence or making it up the corporate ladder. 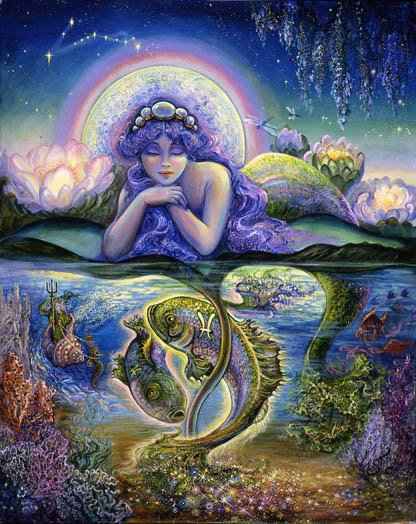 Pisces are tuned in to a higher purpose and their dreams transcend the individual. A deep love for humanity, and compassion that knows no bounds is found with this placement of the Sun. Pisceans are not known to be cutthroat business types, nor are they given to throwing themselves out into the world in an aggressive manner. But make no mistake about it, Pisces can be extraordinarily successful when given the chance to express themselves. The arts, marketing, music, teaching, drama, healing arts…these are all fields in which Pisces can find expression. Their imagination, attunement to humanity, and remarkable intuition endow them with enviable gifts of insight and creativity. Pisces is a sensitive sign—both sensitive to criticism and sensitive to others’ feelings. Easily touched by human suffering, at least in theory, Pisces wouldn’t hurt a fly. They believe in people, are deeply hurt by compassionless human behavior, and have a hard time saying no. Harsh realities are avoided either through escapist behavior or self-delusion; but every now and again reality does raise its ugly head, and hits Pisces over the head. This is a sad time indeed. Pisces retreats into their own world, self-pitying and giving pep talks to themselves (“I will never trust again!”). Rest assured, though, that these periods are rather short-lived and even useful. Pisces seems to derive energy from their (generally short) bouts of self-pity. They come back stronger, with a spring in their step, ready to face the world again, and just as, if not more, compassionate and trusting as they were before. Some might even wonder if Pisces finds pleasure in suffering. Sometimes this is the case, but most of the time, Pisces pulls a lot of creative energy from sadness. Pisces is the poet or artist with angst, although this trait is often more apparent with Moon in Pisces. Many Pisces seem almost allergic to things like shopping lists, maps, directions, and instructions, and for some brave souls, even watches — they prefer to feel their way through life than to follow some plan. We find plenty of artists, poets, and musicians with Sun (and other personal planets) in Pisces. Piscean themes are woven throughout the songs of Billy Corgan of the Smashing Pumpkins and Kurt Cobain of Nirvana, for example.